This marked the beginning of London’s first Museum which is now known as the Museum of [Indigenous] Archaeology. Fifty-three years later, this Museum operates one of the largest archaeological research programs in the province, and is one of a few museums in Canada specializing in archaeology. The history of the development of the Museum is a fascinating story of the innovation and determined efforts of Wilfrid Jury to realize a life long dream. As a first step, Dr. Jury began the study of the 11,000 year occupation of southwestern Ontario by native peoples. In the early years, he conducted a comprehensive survey of the local area, which resulted in the location of several hundred [indigenous] sites. Through excavations and the acquisition of collections from local residents, Dr. Jury amassed one of the largest collections of Indian artifacts from sites in the region. This collection forms the basis of the Museum’s present interpretative and research programs, and has made a significant contribution to our knowledge of local prehistory. 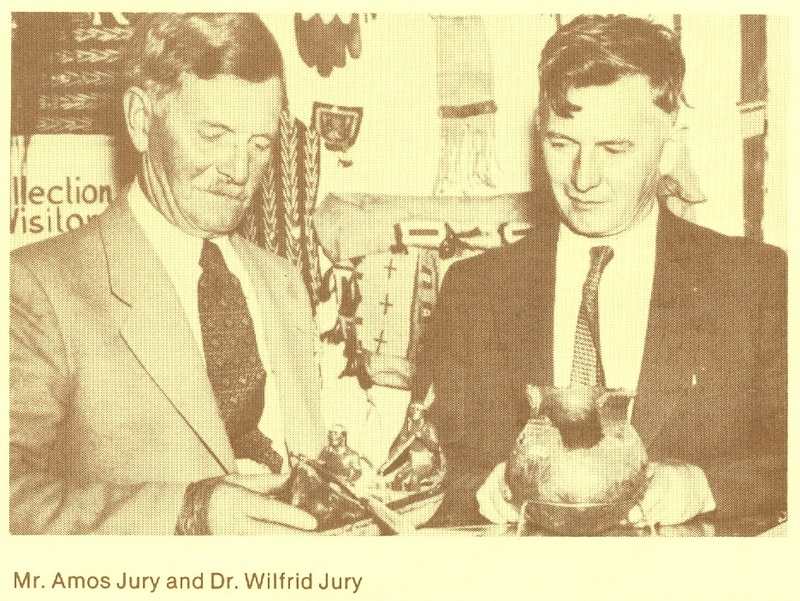 Exhibits of Dr. Jury’s collection have been continuously displayed at the University, and have been shown throughout southwestern Ontario including the Western and Stratford Fairs. During the course of his investigations, Dr. Jury was innovative in his adoption of new archaeological methods. For instance, the Burley site located south of Grand Bend, excavated in 1950, was the first archaeological site in Canada to be Carbon 14 dated. Archaeological investigations were also conducted at numerous other sites in this area. The results of these early investigations were used to establish a Museum Bulletin which is now the oldest viable archaeological publication series in the province. After World War II, the Museum’s area of interest shifted almost totally to Huronia where financial support was more readily available. Here Dr. Jury continued his innovative approach to archaeological studies. In 1950, the first field school in Canada was established. For most of the fourteen years that the field school operated, excavations were conducted at the Forget site, a 16th century Huron village. This became the first Iroquoian site in Ontario to be almost completely excavated using modern techniques. This archaeological research in Huronia led Dr. Jury and his wife, Dr. Elsie Jury, to undertake the reconstruction of several prehistoric and historic sites. These unique projects were designed to increase public awareness of our native and pioneer heritage. In 1954 – 55, the Jurys built the Huron [First Nations] village in Midland, the first [First Nations] village reproduction in Canada. Hundreds of thousands of school children and tourists have visited the village, and have seen and participated in everyday Huron life. Beginning in 1963, the Jurys began the reconstruction of two major historic sites: Ste. Marie Among the Huron in Midland, and the Naval and Military establishments in Penetanguishene. These have become major tourist attractions in southern Ontario. While working in Huronia, Dr. Jury also continued to build the Museum’s pioneer collection. In 1957 – 58, the collection was used to establish Fanshawe Pioneer Village, a co-operative project of The University of Western Ontario and the Upper Thames River Conservation Authority. This was one of the first pioneer villages in Ontario, and has become a popular attraction in London. In 1969, Dr. Jury was instrumental in acquiring the Lawson site; the property donated by the Lawson family, long-time friends of the Museum. Elizabeth Klinger and Martha Hamilton of the Fuller family also donated property to provide access to the site. This site is currently being developed as the first on-site [First Nations] village reconstruction in Canada. Plans are also underway to construct a new building beside the site to house the Museum’s collections, exhibit gallery and research facilities. Since 1976, the policy of the Museum has reverted to that of 1934; to work primarily in southwestern Ontario and to establish the Museum as a centre of study for the archaeology of this region. To date, the emphasis has been primarily on the study of the prehistory of Elgin and Middlesex counties. Future newsletters will contain reports on these investigations. You can sign up for the Museum of Ontario Archaeology’s Palisade E-Post to keep up to date with the museum now!